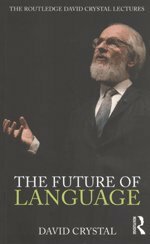 For the first time, The Future of Language brings together three of Professor David Crystal’s most popular lectures on the future of language. One of the world’s foremost experts on language and English language, and arguably the most accessible and entertaining writer and lecturer in this area, Crystal delivers these informative and highly enjoyable performance lectures exploring key contemporary language issues: 'The Future of Englishes', 'Language Death' and 'Internet Linguistics'. An accompanying book with Crystal’s commentary on the lectures is included within the DVD package. This book supplements the lectures with a short overview of the main themes discussed, followed by a more detailed introduction to each topic and a synopsis of all the main points made in each lecture. The book concludes with Crystal’s reflections on how the three interrelated topics covered here will continue to interact and contribute to the evolution of language. an index both for the DVD and the book so users can search for topics of interest. This is an ideal resource for all university and A Level English Language and Linguistics departments and will be of interest to anyone involved in the study of language, especially those involved with teaching or learning English as a second language. For more about David Crystal at Routledge, visit: www.routledge.com/textbooks/9780415485746. View More In Economic Conditions.